I have a new HP ProLiant DL360 G7 system that is exhibiting a difficult-to-reproduce issue. The server randomly hangs at the "Power and Thermal Calibration in Progress..." screen during the POST process. This typically follows a warm-boot/reboot from the installed operating system. The system stalls indefinitely at this point. Issuing a reset or cold-start via the ILO 3 power controls makes the system boot normally without incident. When the system is in this state, the ILO 3 interface is fully accessible and all system health indicators are fine (all green). The server is in a climate-controlled data center with power connections to PDU. Ambient temperature is 64°F/17°C. The system was placed in a 24-hour component testing loop prior to deployment with no failures. The primary operating system for this server is VMWare ESXi 5. We initially tried 5.0 and later a 5.1 build. Both were deployed via PXE boot and kickstart. In addition, we are testing with baremetal Windows and Red Hat Linux installations. HP ProLiant systems have a comprehensive set of BIOS options. We've tried the default settings in addition to the Static high-performance profile. I've disabled the boot splash screen and just get a blinking cursor at that point versus the screenshot above. We've also tried some VMWare "best-practices" for BIOS config. We've seen an advisory from HP that seems to outline a similar issue, but did not fix our specific problem. Suspecting a hardware issue, I had the vendor send an identical system for same-day delivery. The new server was a fully-identical build with the exception of disks. We moved the disks from the old server to the new. We experienced the same random booting issue on the replacement hardware. I now have both servers running in parallel. The issue hits randomly on warm-boots. Cold boots don't seem to have the problem. I am looking into some of the more esoteric BIOS settings like disabling Turbo Boost or disabling the power calibration function entirely. I could try these, but they should not be necessary. All firmware up-to-date as of latest HP Service Pack for ProLiant DVD release. Calling HP and trawling the interwebz, I've seen mentions of a bad ILO 3 interaction, but this happens with the server on a physical console, too. HP also suggested power source, but this is in a data center rack that successfully powers other production systems. Is there any chance that this could be a poor interaction between low-voltage DIMMs and the 750W power supplies? This server should be a supported configuration. So, after bringing a third system into the mix, and experiencing the same issue, we began to question the environment. 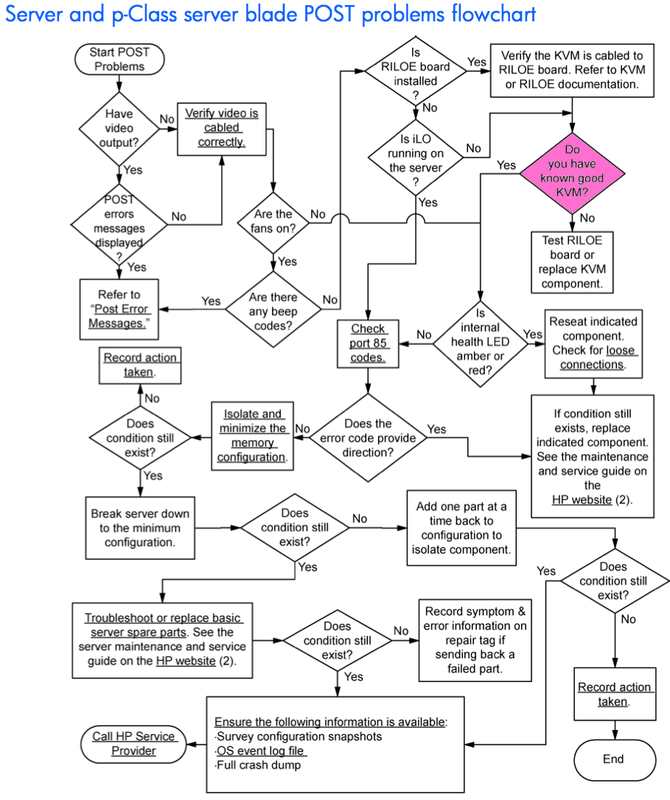 I dug up a copy of the HP ProLiant Servers Troubleshooting Guide and found the POST problems flowchart shown below. Carefully running through the steps in the chart, we realized that the one constant across all of the servers was a KVM switch attached to the data center crash cart. This was a consumer-class USB-enabled KVM. As per the highlighted node in the flowchart, Do you have known good KVM?, I could not answer conclusively. So, we unplugged the servers from the KVM switch and ran an automated boot, sleep 300; reboot sequence in rc.local. The servers had no issues with this, regardless of the normal DIMM, low-voltage DIMMs, PSU wattage, etc. Not the answer you're looking for? Browse other questions tagged hardware hp hp-proliant or ask your own question. iLO 2 remote console NO VIDEO? Is there a complete reference for HP's diagnostic port 84 and/or port 85 codes? How do I disable “Processor Power and Utilization Monitoring” on an HP ProLiant server? How to boot HP Proliant DL360 G6 with the front panel missing (no button)?